Henry Butler was forced to relocate to Colorado after Hurricane Katrina, but since his departure, he has continued to produce essential recordings of his incredible blend of blues, jazz, and New Orleans R&B-based piano on the Crescent City’s Basin Street Records label. His latest effort, PiaNOLA Live, incredibly, is his first live solo album. According to the liner notes, these recordings were hand-picked by Butler and co-producer George Winston, and capture performances ranging from the 1980s to the present. Unfortunately, the liner notes don’t indicate which songs were recorded at which time, but you won’t care a whit because the performances are so consistently fine that it’s impossible to tell which is which. Of all the talented and gifted piano wizards with origins in New Orleans, the one Butler most brings to mind is James Booker. Booker’s muse was such that he could begin a song as a Professor Longhair-type shuffle, plunge into a classical flourish, and finish up with hints of Art Tatum or Bud Powell, all in a three or four minute span. Butler possesses those same qualities and a classically trained voice to boot. The disc opens with a couple of jazz tunes, a fine version of the standard “Basin Street Blues” and Butler’s own signature tune, “Orleans Inspiration,” which not only pays tribute to those piano players who preceded him, but also gives a nod to Butler’s own subsequent contributions. Butler also tackles some New Orleans R&B chestnuts as well, including a fun take of “Mother-In-Law” (with Butler handling the bass and tenor vocal and encouraging the crowd to participate as well), a slow bluesy interpretation of Otis Redding’s “Dock Of The Bay,” Chris Kenner’s “Somethin’ You Got,” and a sweet extended version of “Tipitina,” that starts out slow and builds to a thundering climax. There’s also a rollicking version of “Let ‘Em Roll,” from Butler’s 2000 collaboration with Corey Harris, Vu-Du Menz, and Billy Preston’s “Will It Go Round In Circles” gets a funky revamping. The standards, “You Are My Sunshine” and “Old Man River” are also well done and highlight Butler’s romantic side. The closer, “North American Idiosyncrasies,” is a stunning interpretation of a blues piece written by one of Butler’s teachers, clarinetist Alvin Batiste. 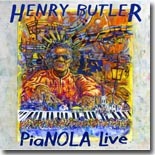 Though he’s relocated far from New Orleans, PiaNOLA Live shows that Henry Butler’s love for his native city and its musical influences surpasses all natural boundaries. Anyone who has even a passing interest in New Orleans piano will want to get their hands on this set.